THE pressure of expectation was ultimately too much for local boy Ashley Hugill as the wait for a first win in his hometown snooker tournament goes on. Hugill showed flashes of his considerable promise but ultimately went down 6-2 to Anthony McGill in the first round of the Betway UK Championship at the York Barbican. The 23-year-old barely got a look-in as McGill raced into a 4-0 lead with breaks of 84, 66, 105 and 108 and although he managed to narrow the deficit to 5-2, the Scot wrapped up victory with a run of 110. It was the world No 116’s second appearance at the prestigious event, following his first-round loss to Shaun Murphy in 2015, and he admits all the additional requirements around his home event throw him off slightly. “I feel a little more pressure playing here but it’s sort of more expectation than pressure,” said Hugill. “It’s the only tournament of the year where I have to do media work! McGill has been a model of consistency this season, reaching one ranking event final, one semi-final and three further quarter-finals. And Hugill concedes that he was unable to live with the incredible standard that the world No 17 set in the early going. “He played really well to go 4-0. In those first four frames, I don’t think I got a chance until I needed snookers,” added the Yorkshireman. “I could have won the frame to go 4-1 and if I won that it would have been 4-3 by the end but he just played so well that it was always going to be an uphill task from the interval. Meanwhile, veteran Leeds potter Peter Lines edged a final-frame thriller with China’s world No 29 Zhou Yuelong. Lines and Zhou started play in the morning session but were hauled off at 5-5 to allow the afternoon session to commence and when they returned after the evening’s matches, the Englishman did enough to seal a 6-5 victory and book a second-round tie with another Chinese player, Xu Si. It was a good day for the Lines family, as Peter’s son Oliver also came through the first-round win a 6-3 win over China’s Mei XI Wen. Elsewhere in York, world No 2 Judd Trump battered Australia’s Matthew Bolton 6-0 to book his place in the second round. 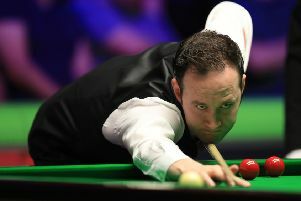 Trump courted controversy at the Northern Ireland Open last week as he trailed Stuart Carrington 3-2 and 52-0 in the first round when he missed a red to the middle pocket, before conceding the frame by angrily throwing his cue at the ball with 83 points remaining. He was fined by World Snooker for conceding a frame while he still had enough points to win, and again for failing to fulfil his post-match media duties. And addressing the incident for the first time, the 28-year-old – who had reached the final of the Shanghai Masters barely 48 hours before – was unrepentant.